SINGAPORE — Prime Minister Lee Hsien Loong today (April 6) shared a candid memory of his late father, Mr Lee Kuan Yew, on his Facebook page. 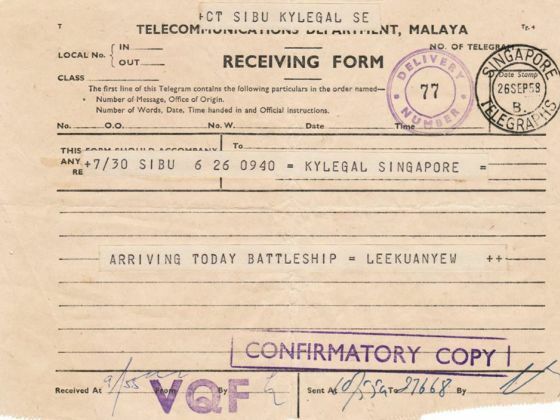 PM Lee posted a picture of an old telegram that he found while sorting through his father’s items. Dated Sept 26, 1958, the late Mr Lee, who was practising as a lawyer in Lee & Lee then, simply wrote “ARRIVING TODAY BATTLESHIP = LEEKUANYEW”. PM Lee shared that his father had intended to inform the family that he will be expected home from Sibu, Sarawak, and that he’d wanted to have steam boat for dinner that night. But, Mrs Lee did not understand the message when it was sent. She thought Mr Lee was returning on a battleship. PM Lee recounted that the law firm’s secretary even called the British Naval Base at Sembawang to check if any battleship was arriving from Sarawak. But no one knew anything about it. The steam boat dinner was not to be that night, but the fond memory remained for PM Lee.